Starring: The vocal talents of Billy Crystal, John Goodman, Steve Buscemi and more. A prequel that ultimately is unnecessary, yet wonderfully enjoyable, is a nice surprise when my initial fears were that Disney would ruin the beauty of one of my favorite Pixar films of all time. 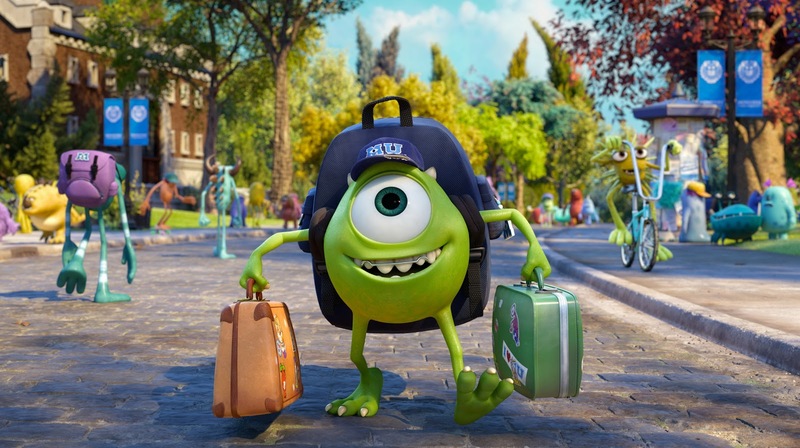 Monsters University brings on the nostalgia and the nuances of its predecessor and invites viewers of all ages to enroll in the fun it brings for all to enjoy. 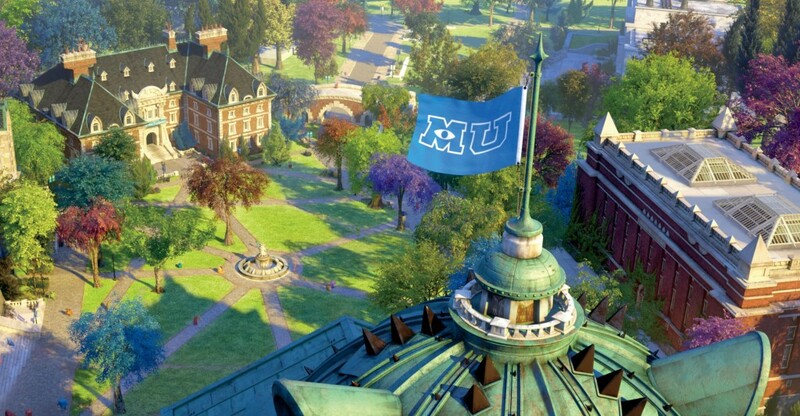 Hit the jump to see if Monsters University is a school worth enrolling in. 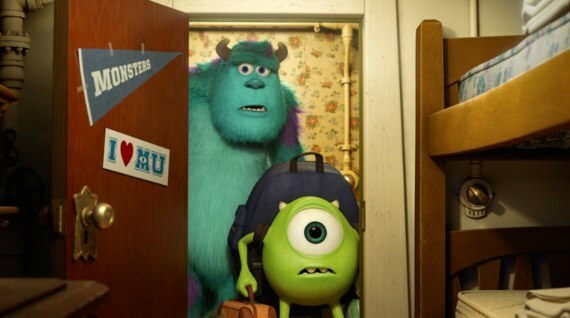 See where it all began with Mike and Sulley on the campus of Monsters University. This prequel impresses with animation, characters, story and enjoyment. The strength of any “film franchise” is its continuity and relatability of all of its aspects and Pixar did a decent job with this one. Not only is it an insightful history into some of Pixar’s most beloved and/or recognizable characters (Mike, Sulley, Randall, etc), it is also a meaningful story with a message of a young green one-eyed monster who was always told he couldn’t amount to anything or belong anywhere, yet worked to defy all the naysayers (along with messages of teamwork, self-discovery, friendship, hard work and more). Prior to watching, I wasn’t aware of all of the talent involved in voicing the characters and was pleasantly surprised to read Charlie Day, Alfred Molina, Nathan Fillion, Aubrey Plaza, John Krasinksi and Helen Mirren as additions to Billy Crystal, John Goodman and Steve Buscemi! They did a really great job grabbing the essence of a college campus and characters you meet during college. 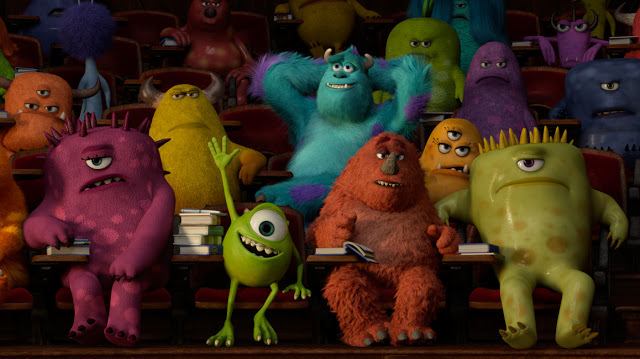 The voices of those characters added a different element that made Monsters University even more fun. 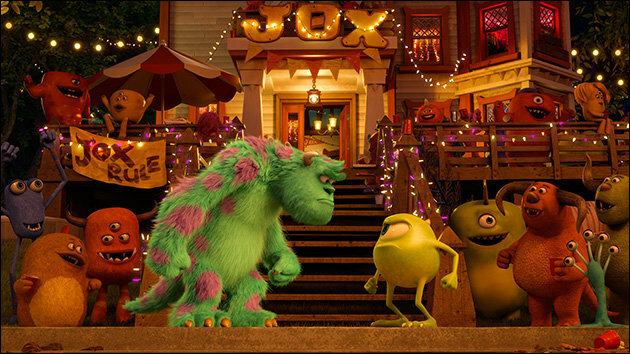 Some added bits that just made the Pixar-created world of monsters so great once again was the little details in architecture, names, symbols and more that added to the world of “Monstropolis.” What Monsters University does seem to lack is the heartfelt emotion that made the first one such a success. 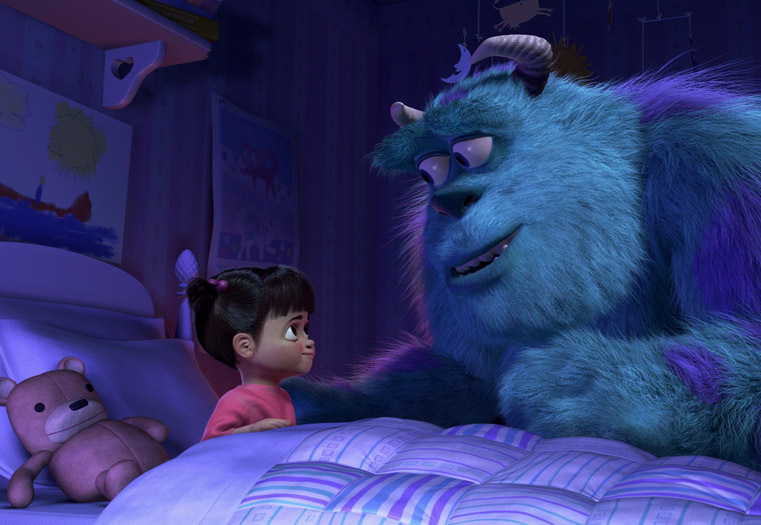 Remember the feeling you had at the end of Monsters Inc? Of course you do! Who can forget? Well, Monsters University has a few moments that try but don’t reach the same level of the “awwww” factor. That along with its predictability make this prequel acceptable but not as much of a solid homerun as the first (i.e. “Boo”). I am just glad the makers of Monsters University took some learning from the bad sequel, Cars 2. When you go to see Monsters University (and you should go see it…3D isn’t really necessary), get there early and do not miss the traditional Pixar short that precedes the main feature. 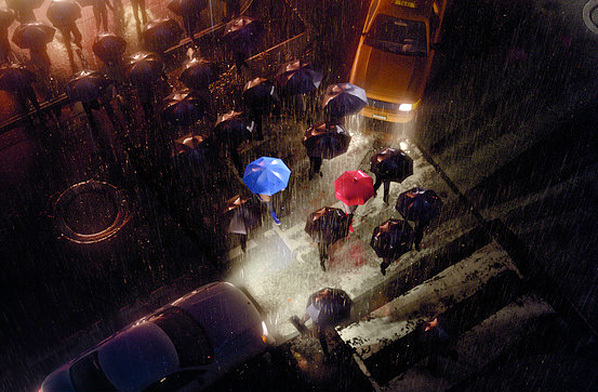 This year’s Pixar short, Blue Umbrella, is cute but really won points with me with its amazing animation that looked SO real! Wow! Very impressive. Monsters University definitely brings back some of the Pixar magic with a beautiful animated feature that contains a wonderful message with enjoyable storytelling and equally great characters. 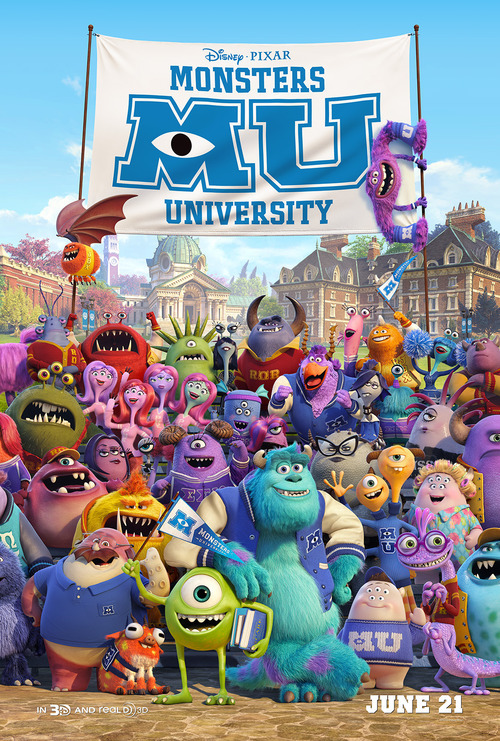 Tying directly into (debatably) the greatest Pixar movie ever, Monsters University rides on the success of its predecessors and offers us a subsequent prequel that is acceptable, fun and comparable to the original (a not-so attainable feat in the world of prequels/sequels). Monsters University is one cool school! Really looking forward to catching this one, glad it’s a good one. You know, I was initially disappointed that Pixar were again treading on the sequel/prequel path, but from what I hear (including this fab review, Terrence) Monsters University is a welcome return to form for the animation giant. I skipped a lot of what you’ve written (keeping myself spoiler free) but I’m glad to see you rated it 4/5. Can’t wait to see it myself!! I enjoyed it. Thanks for stopping in. I understand skimming reviews prior to watching yourself. I imagine we will have a lot of comparable notes after you see it! Thanks Tim. Will you be seeing it? Good to see this has sullied (ha!) The good Monsters Inc name. Nice write up man. haha. I used to only think of Monsters whenever I saw the word “sullied.” Now I think of Game of Thrones. LOL. I was hoping this would be pretty good. Glad to see it meets your approval. It also looks like Pixar has stepped up their graphics game again. absolutely. I want to see this one again. It was fun. Not as good as the first, but so great! and the graphics were impressive. The actors put in great voice performances. The most noteworthy includes Helen Mirren as Dean Hardscrabble, the headmistress. She’s flawless in conveying a strict authoritarian that should not be crossed. I enjoyed this a lot. Great review!